Free is good, right? Someone offers to pass along something to you at no cost, should you take it? Maybe, maybe not. I love going to garage sales. Once in a while, the homeowner is so anxious to get rid of something that they offer it for free. In the past, I have jumped on these opportunities. Who wouldn’t want something for nothing? Lately though, I’ve begun to re-consider. Here is why. The free item needs too much re-furbishing. We have stumbled through this one several times. Last summer, a lady on the street next to ours had a wonderful sale. She was very eager to move her things. I found a brand new magazine rack for 50 cents, a 2 foot diameter artfully crafted wreath for $10 and a FREE WHEELBARROW. I brought that wheel barrow home for hubby. It was beat up but usable. It had been left outside and there was a small hole in the metal and it was a bit rusty. Hubby loved (and still loves) his free wheelbarrow, but he wanted it in primo shape. He scraped and sanded the metal and loaded it up with Rust-oleum – about 4 cans worth at $4 plus a can! Heck, we probably could have almost bought that wheelbarrow new for $20 instead of sinking $16 into one with a hole! The old beat up bench. Nope, I didn’t learn my lesson with the wheelbarrow. This past weekend, I went out garage sailing just for fun. I spotted a beat up old park bench and though it wasn’t exactly free (I paid $5), it was close enough to count for this discussion. The slats are weathered with a few small cracks and the iron parts have some rust. Of course I want it to look nice in my yard so now I am spending time and money on it. I took it apart (which took about an hour) and am stripping the paint off the iron (think at least one can of paint stripper) and then will spray with Rust-oleum – and I just found out that the cans I thought I had had been used on lamps! The free item starts a collecting binge. I think certain people have an inherited collecting gene. I think my spouse is one of them. When Mom and Dad passed, my Brother inherited the house and all their stuff – which they in turn had inherited from the prior generation. Among those items was an antique table lamp. On our last visit, my Brother urged us to take that lamp home with us. I really didn’t want it, but hubby thought it looked neat and was a family ‘heirloom’. So it got in the van for the trip home. My spouse studied up on it and fixed it up so it works again. Then, he decided it needed a companion or 4 so he found some more on eBay. Of course they needed fixing up so he found a place in town that puts new brass coatings on, and trust me, those don’t come cheap. So far, my guess is that our free lamp and it’s new companions have spent more than $500 of our money! The free item takes up too much space. My Mother-in-law broke up her household of 50+ years in 2009. She gave first choice of the items to her 4 children and their families. Hubby wanted the oak drawers and shelves that his Dad (the architect) had pulled out of the high school chemistry lab. These things are 5 feet long and 4 feet high! His Mom really, really urged him to take two broken mahogany end tables so he could fix them up. These things now live in our garage, taking up space that we don’t have! Nothing much can be stored in the oak drawers as they are quite small. I don’t like mahogany furniture, and hubby hasn’t gotten around to spending time on those end tables, so I doubt these things will ever be of much use to us. But hey, they too are ‘family heirlooms’. Sigh. The free item extracts too high a price. and it reduces restrictions on what law enforcement can do (including letting citizens be retained with no cause) and lets law enforcement officers search a home or business without the owner’s or the occupant’s consent or knowledge, among other things! What has been the price of free stuff for you? My mom loves to get free stuff that needs work and then never do the work. Then it just becomes clutter! Luckily, I don’t have that habit anymore! Clutter definitely brings issues of its own! I can certainly attest to that. It’s really wonderful to get free stuff or things that are almost free, but we must be careful that we don’t fall into the habit of stuffing our home with free stuff that we don’t really need or will just clutter our free space. Sooooo true. Too much stuff is just overwhelming and so much extra work! This is definitely an original thought! I often don’t take on free stuff either b/c I know I won’t get to fixing it, or don’t want to have to rearrange something to put it somewhere. 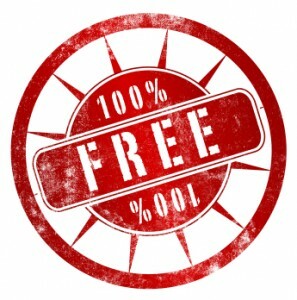 Although free is hard to resist… as you note, it can exact a price of its own. Why bring up the Patriot Act? I don’t see why this is relevant to the other parts of the discussion. But this article does make some good points. I hate it when I take “free” stuff and find I have to put time and money into the things to fix them up or reconstruct them into something new. Oh so what do you do when people decide on giving their stuff to you? You just say no? And that’s why I think the first and best thing to do before we accept free stuff is examine them first.